It’s time to read a book with small doses of creepy, spooky and even . . . terror! Do you dare to read along with us? 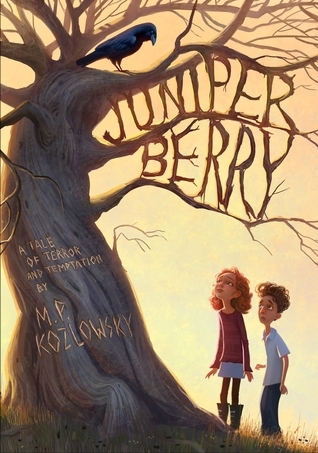 Juniper Berry is the debut novel for author M.P. Kozlosky. A modern fairy tale with many twists. Temptation. Intrigue. Mystery. Juniper and Giles befriend each other one night in the woods. Both of them have noticed that their parents seem different and neither are happy about it. What could be going on? In their search to find out they must confront their fears and make some very important decisions. I just finished chapter 5 and I am curious about many things: those balloons, the axe, the fans at the gate. . . . What might come into the story in the next few chapters? LOVE the book! I’m on chapter ten. I think it’s SO good I read it all weekend! It certainly does begin to get very dramatic! So pleased you are enjoying it. Do you like the suspense? and mystery? Great to hear that you enjoyed this so much Alyson! I have another Book Club future book that I know you will also LOVE! Lots of creepy and scary suspense.